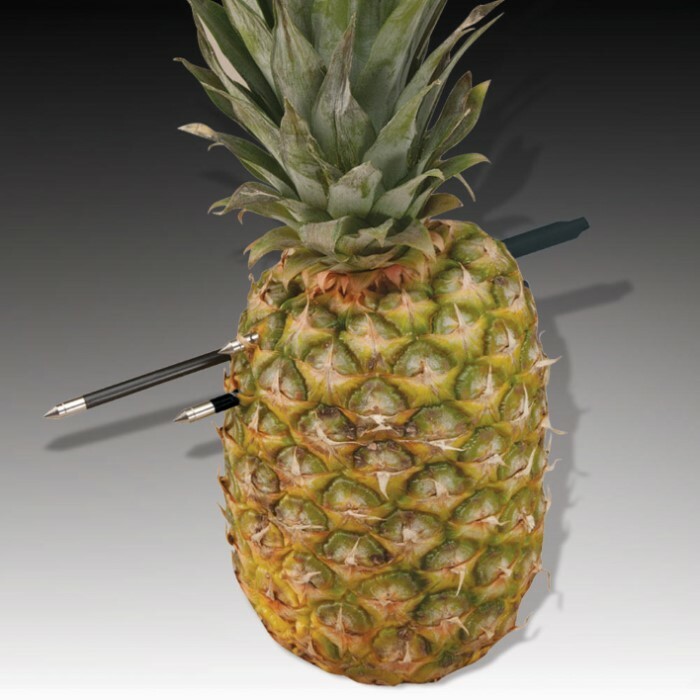 These razor sharp darts are compatible with any crossbow EXCEPT our 150LB model. Each dart measures 6" from end to point. 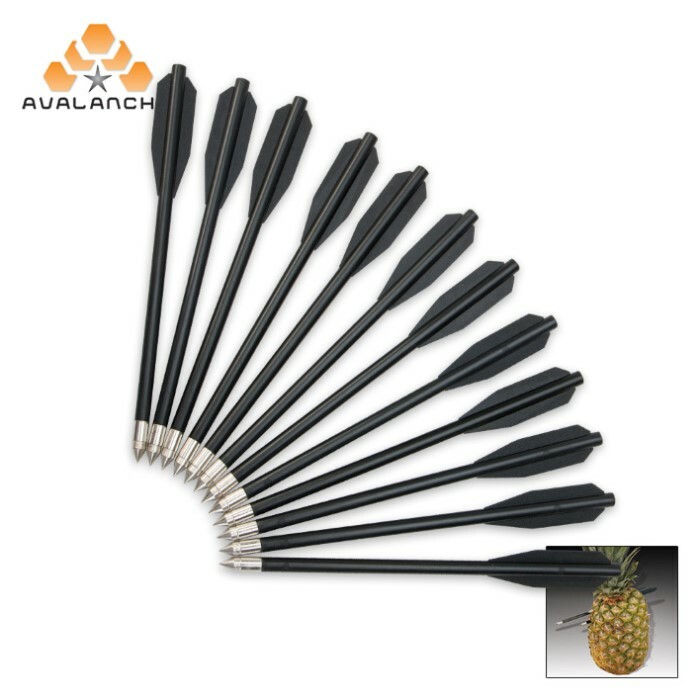 Each package includes 12 razor tip darts. Buy a few packs at this price. They fly true, keep a decent point and are affordable at this price. Throw them in your kit pack and keep the fun going. I run them over a whetstone occasionally to hone the point. A friend of mine bought 8 packs of these and they came in the mail yesterday. We spent the whole day shooting, and I must say we were very surprised with these bolts. They fly great and surprisingly enough are far more durable than their aluminum counter-parts. The only ones that broke were the ones that hit solid wood and then it was only the tips that broke off. Great bolts, shot them into trees and straight threw half inch plywood. Only lost the tips when it hit a rock and from pulling them out of plywood. One of my bolts actually went all the way in and disappeared into a block of styrofoam... and is still there. The tips on these will come off in the target if it is made of wood. However These were made for shooting paper targets and maybe fleshy ones if you catch my drift. The heads still stick in the wood but the abs pops right out of the tip. You can just stick them back on. Perhaps they would not if they were super glue'd or apoxied-sorry if I misspelt that. 4/5 because I think they will serve there purpose but not great very pointy by the way. these are sharp, sturdy, and accurate. all the things a dart should need. be careful though. WOW these arrows are really sharp!, metal tips, with a straight back, with fins, little but powerful! there 12 for 3.99...GET THEM! GET THEM NOW! especially if your going to buy a crossbow. they brake when over used but it takes a long while, none the less, there worth the 4 bucks you spent on them. 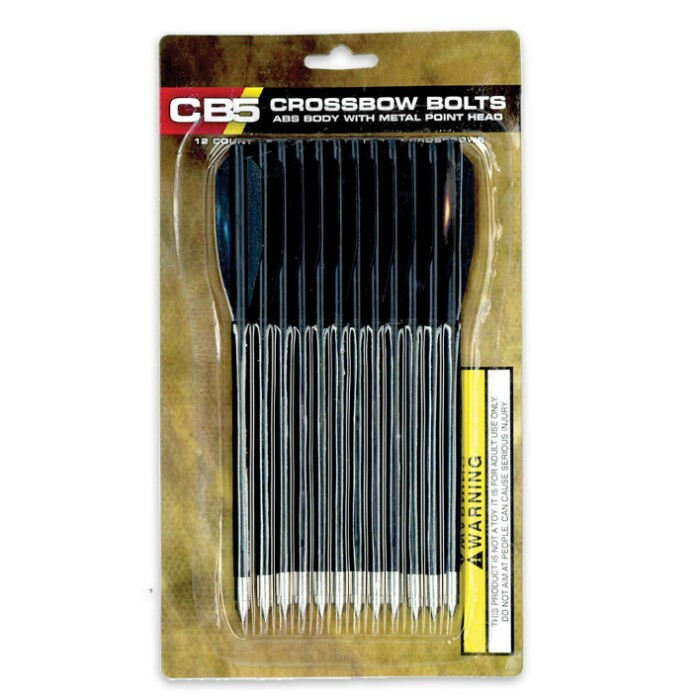 I Seriously Reccomend Picking These Up With ANY cross-bow model that its compatible with for target practice, The 5 bolts the 45lb cross bow came with are just not going to cut it, Bolts probably will get knicked, These are a great product accesory for only $3.99!